It was my little munchkins birthday yesterday and I didn't get around to announcing a winner. So here it goes. 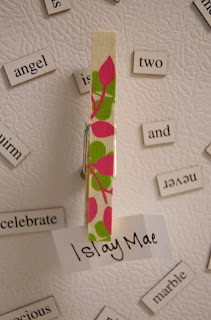 The winner is... Islay I will put your magnets in the mail on Monday! I hope you enjoy them! Have a Happy Halloween! I just thought that you would be interested to find out that Amanda and I LOVE this craft! What an easy and inexpensive way to brighten someones day! Today, while Amanda and I were at my mom's house making crabapple jelly, we decided to make a bunch! They turned out to cute! I have pictures on my blog as well as my craft blog! Thanks Bails for the great idea!